There’s a danger lying in wait on many trails across the country. It was put there deliberately and often stands in plain sight. Yet many are unable to recognize it. It’s been been almost 6 years since that fateful day when Giuseppe (Beppe) Maino died as a result of a bollard crash on the Richland B&O Trail in Richland County, Ohio. 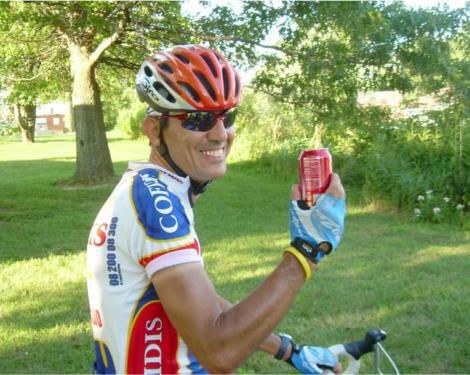 A sad irony that compounded this tragedy was that Beppe was one of the safest and most experienced cyclists I’d ever met. His senseless death sent shockwaves through me and my community. As a logical thinker, I knew that the “post in the middle of the trail” infrastructure treatment was a bad idea. But there they were, 49 sets of tall, rigid steel bollards on the 18-mile long B&O Trail. They had been in place since the trail was constructed in 1995. For the remainder of the 1990s and the decade that followed, you could find these hazardous obstructions on any Ohio multi-use trail build that was overseen by ODOT. That is, until that fateful crash on the B&O in 2012. Thanks to local press coverage of the crash, along with the blog series, ‘The Trail Bollard Hazard,’ word spread regarding this common danger that exists on many trails. As a result, center bollard removal (those placed directly on the trail surface, often as part of a set of 3) took place on other trails in our region and in neighboring or nearby counties. Many bollards were replaced with a lightweight plastic fold-over substitute, while the Tallgrass Trail in Marion County was constructed without bollards. In all likelihood, it became the 1st multi-use trail in Ohio to go bollard-free. By 2014, all center bollards were removed from the B&O Trail as well. In the years that have passed since these safety improvements were made in our area, I have often been reminded that in many parts of our state and country — and even the world — there is virtually no concern (or awareness) for this hazard. How could I know such a thing? I still see solid bollards on trails when I travel out of my local area. I also read countless articles, reports and quotes that include praise for the beneficent bollard. Many authored by trail or bike advocates. Obviously, if the dark side of this issue were better known — that bollards do harm and can even kill the very users they’re supposed to protect — surely there would be more discussion today regarding this danger. So, why isn’t this hazard widely known? I believe it’s primarily due to the fact that national or statewide bollard crash data does not exist. No data means there are no studies or reports to educate advocates, trail builders, trail groups, transportation planners or their communities regarding this hazard. Everyone is equally in the dark. This conspicuous absence of webinars, workshops or studies regarding this hazard has a chilling effect. It often means business as usual regarding solid bollard use, which perpetuates the danger. As a result, communities have had to experience bollard injuries/fatalities firsthand to discover this danger for themselves. That’s right, trail tragedies are required in order to create awareness of this danger! If killing or maiming some trail users isn’t horrific enough for you, consider this — Communities don’t always learn the proper lessons from these crashes. Not all bollard crashes get sufficient public exposure or draw sympathy from community members. Some believe these crashes are the trail user’s fault. That can include trail managers. Little do they know that their ignorance puts their own family, friends and fellow community members — and anyone who uses their local trail — at continued risk, should they do nothing to curtail this danger. If you think "ignorance" is a harsh word choice here, actually, it’s most appropriate in this context. It’s those who are uneducated regarding this hazard who are singing the praises of widespread bollard (& barrier & gate) use on bikeways and trails. After the NYC bikeway terror attack in October 2017, bollard praises turned to shouts for more barriers on trails in various cities across the U.S. Installing them everywhere, without sufficient knowledge of their dark side, will never get any community closer to Vision Zero. For you see, when an infrastructure treatment is indeed dangerous, it will continue to do damage in the communities where it is used, regardless of whether any terrorist acts ever take place there. Why Is There No Data?! Today, we study everything. So why are there no statewide or national bollard crash statistics to examine? As I discovered during my research into B&O Trail bollard crashes, this data is not kept in a file somewhere. And it’s extremely difficult to collect. I was only able to learn about these crashes through methods such as trail user surveys. I found that minor bollard crashes on the B&O Trail (bike damage, little or no injury) were the most frequent type and typically went unreported. Therefore, little on no data is provided to the trail manager, in this case, the County Park district. In cases when a crash is reported, it will not necessarily be logged as a bollard crash in a police report or a hospital emergency room. And when it is, there’s no one out there collecting or compiling this specific information. So for those seeking this data, the result is — nothing to see here — sorry! But don’t think that no official data = no crashes. It simply means you’ll have to use other methods to collect it. We’ll look at how you can do just that, in a future post in this series. In the absence of crash data, what can we use to better serve trail users in regard to this hazard? How about using the standard that’s applied to automotive travel? Consider this: We go to great lengths to protect people in cars. And rightfully so. We not only install crumple zones, seat belts and air bags in their vehicles, but we include infrastructure treatments on roads that are designed to be as forgiving as possible. We know drivers, being human, have errors in judgement. They make mistakes from time to time. So roadways are designed with these errors in mind. That makes sense. And that’s why you won’t find any solid steel bollards in the middle of a roadway. Take a moment and think about that. But you’ll find them in the middle of many bikeways. And there — of all places — where runners, bladers and bicyclists have none of the special protections afforded drivers in their protective shells. In a trail bollard crash, the trail user is the crumple zone. So why isn’t the same "forgiving" approach used on bikeways? Are peds and cyclists somehow less important? Are they not humans who also make mistakes? The bikeway bollard treatment makes a strong case that trail users are treated as second or third-class citizens. And who relegates them to this lesser-deserving status? Any organization or advocacy group that approves such dangerous treatments, as well as any trail group or trail builder who willingly installs them. Let’s face it, folks. There’s a HUGE double standard here. One that continues to take its toll day by day, wherever these solid objects are placed on a bikeway or trail. In Part 2 of this series, we’ll take a closer look at some lessons learned from B&O Trail bollard crash research. We’ll also look at methods you can use to collect this data on your own, in the event that you’re living with this danger in your community. I just wanna play devil's advocate for this. What do I say to someone who asks the most logical question when it comes to the tragic 2012 death, why blame the [bollard] when clearly he was legally supposed to stop for the intersection? The bollard crash that killed Giuseppe Maino in 2012 did not occur at a crossroad / intersection. Having said that, I'll be glad to answer your question. When you come to a stop at a road crossing along a trail, you stop (or Idaho Stop) on one side of the road. However, when bollards are used, they are typically placed on both sides. So you'll always be riding through at least one set. Also, many bollards are backset away from the crossing by a number of yards. Sometimes 5 to 10 yards or so. When that's the case, you're actually riding through 2 sets, because no one stops at these backset bollards. They stop at the edge of the road where they have the best sightline for crossing traffic. And finally, here's something to consider for those who might think that slower speeds around bollards will save you from harm. One of the first crash cases I read about when I started researching this topic, was about a male rider in the carolinas who suffered paralysis from his crash. He estimated his speed at the time of impact was about 10 mph. I would guess that many riders are averaging around that speed when they ride through bollards at a crossroad. To ferret out bollard crash data, one has to mix some detective work with methods that engage trail users in your community. Let’s start with some data collection. The video below recorded bicycle crashes at a railroad track crossing, both on the road and on a nearby bike path. The same method can used for monitoring bollard locations. As they say, the camera doesn’t lie. So if you live in a community where trail management is reluctant to take the bollard threat seriously, you may want to show direct evidence that the hazard is real. 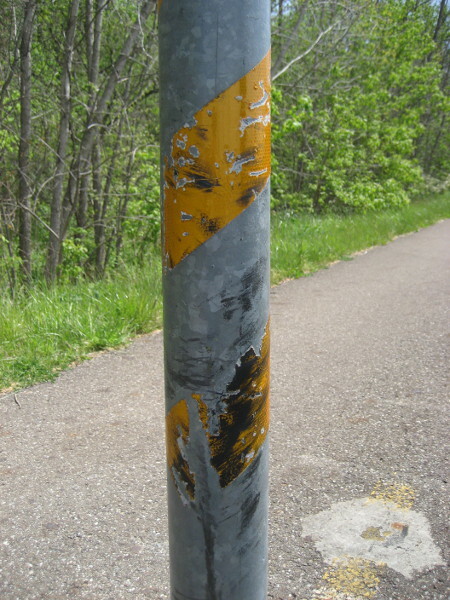 If bollards on your trail show abrasions, such as those painted with high-vis paint, you can inspect them closely for scars and scrapes that may be due to bicycle collisions. Look for scars that align with common pedal-heights. Handle bar scrapes may only be found if the solid bollard is tall enough to record those strikes. Of course, unusual handle bar heights, such as those on a recumbent, will differ from standard bikes. Surveying local trail users is a good method for collecting crash data. Target bike clubs, walking/hiking groups, local wellness program participants, etc. Reach out to as many local groups that use the trail as possible. Ask for respondents names, comments and some way of contacting them. This allows you to follow up as necessary to collect more detailed information. Use local media and social media to spread word of your survey as widely as possible, within as well as outside your community. Also post at trailheads, park offices, bike shops, etc. Bike shops near trails may see damaged bikes from bollard crashes. Possibly some of their own fleet, should they provide rentals for trail riding. They will also hear about injuries and crashes through the local cycling grapevine, which always connects to these shops, which also serve as unofficial trailheads in many ways. Be sure to interview the owner and employees regarding bollard crashes. As mentioned in part 1 of this series, the most common B&O Trail bollard crashes were minor (little or no injury) and typically went unreported. However, another tragic case that came to light, was that another fatality had occurred years earlier, also a probable result of a B&O Trail bollard crash. In that case, a local cyclist’s brother sustained severe head trauma and was transported to a hospital outside of the area where he later died. One survey respondent reported a handle bar strike which turned his front wheel, launching him head first over those bars. He reported somersaulting and landing on his back on the asphalt surface, miraculously unharmed. Before B&O bollard removal would take place, an 80-year-old man bicycling on the trail with his wife, suffered a bollard crash and was hospitalized in serious condition. Sometime after our survey ended, I happened across a young man along the trail who showed me a long scar on the side of his head and gave his account of his nighttime bollard crash. I also considered this “familiarity” factor in terms of bollard placement. While most bollards were at crossroad intersections, a handful of others were placed randomly along the trail, not necessarily where trail users would expect to encounter them. Would these prove more dangerous? The 3 worst crashes that were noted during our survey suggested that this is the case. 1 serious injury crash and 1 fatality occurred at bollards not located at a crossroad. While 1 fatality occurred at a crossroad. A very tiny data sample to be sure, but it also makes another important point: No bollard placement is necessarily a safe one for trail users. And as pointed out in the original Trail Bollard Hazard series, a number of crash scenarios have been established that demonstrate that anyone can fall victim to a bollard crash. Now let’s put this into perspective. It’s important to understand that if you perform this data collection, you are only likely to see a very small slice of the total crash data pie. However, even a small slice can provide useful information. Here are the key stats from the 5-week B&O Trail survey. Our research also revealed a history of car encroachment from a senior center parking lot alongside the bikeway. Apparently some elderly drivers would confuse the bike trail with an exit lane from the parking lot. This last number (above) — 0 users struck by vehicles — allowed me to conclude the obvious, that if the bollards were intended to protect trail users, they were clearly doing more harm than good. I know there are people who feel that trail or bikeway bollards at crossroads are a “must-have” safety measure. They will suggest that if the bollards are properly marked and installed with the latest safety measures (flashing lights, high-vis paint, etc. ), that everything will be fine. And that’s the problem when there’s no data to examine: People develop their own beliefs concerning bollard use. Those beliefs are not only subjective, but often wrong (not backed up by data). Public safety should never be a subjective matter. As I mentioned in Part 1 of this series, people simply make mistakes from time to time. If you put a solid stationary object in the middle of a roadway or bikeway, sooner or later someone’s going to collide with it. And our data confirmed that to be true… and that the result of such a collision can be fatal. So, if it’s time to remove bollards from your local trail and you lack support from the trail managers or local officials, get out there and start collecting some data!